In both cases you will need to track recurring interest payments. 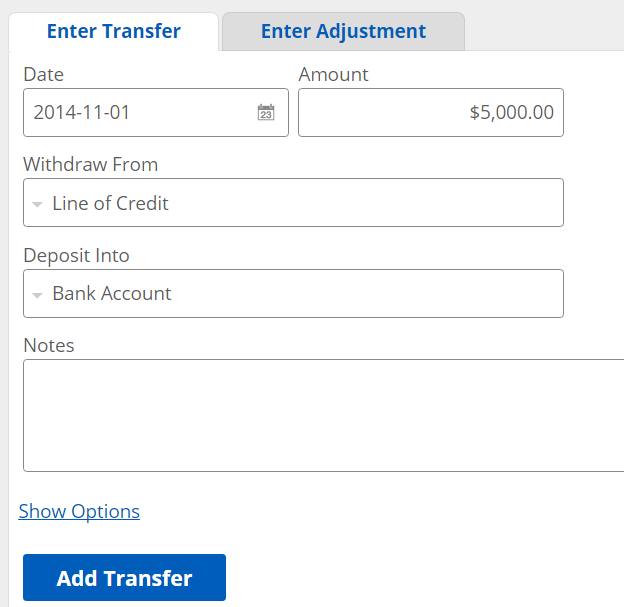 Create a new account named Line of Credit with the Type set as Bank. 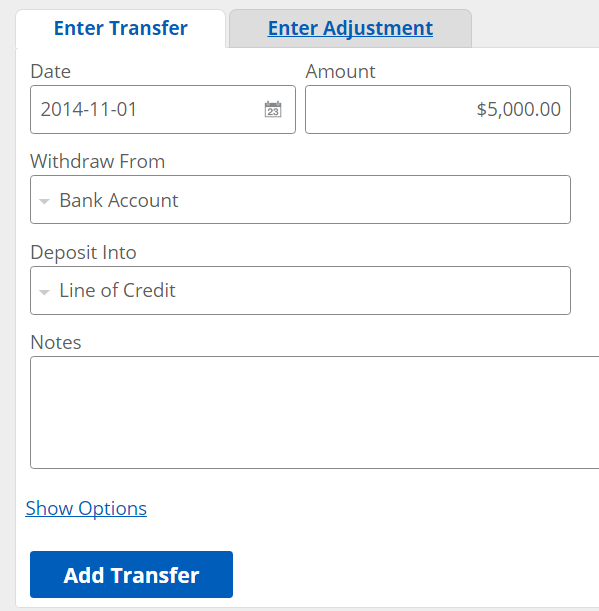 Go to the Journal Entries page and Enter Transfer. To take money out, enter the Date, Amount, and use the Line of Credit account for Withdraw From and Bank Account for Deposit into. To put money in, enter the Date, Amount, and use the Bank Account account for Withdraw From and Line of Credit for Deposit into. 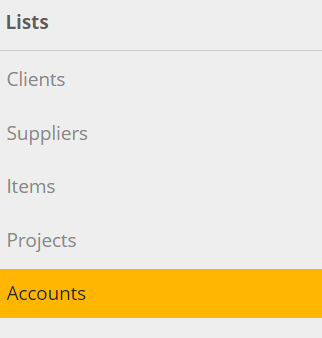 For the Paid from account, choose where the interest payments accrue (sometimes this is your bank account, sometimes this is your line of credit account). For the Category use the Bank and Interest Charges account. 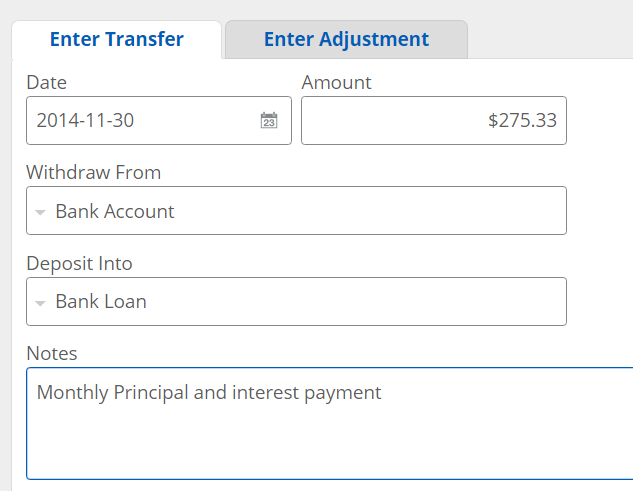 Create a new account named Bank Loan with the Type set as Other Current Liability (for loans to be paid within a year) or Long Term Liability (for loans to be paid over the course of more than a year). 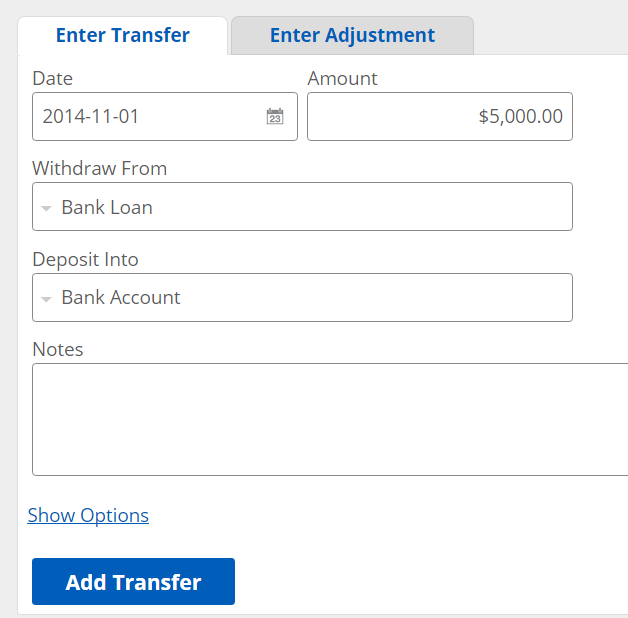 Use the Bank Loan account as the Withdraw From and your Bank Account as the Deposit Into account. There are two ways to handle interest payments. 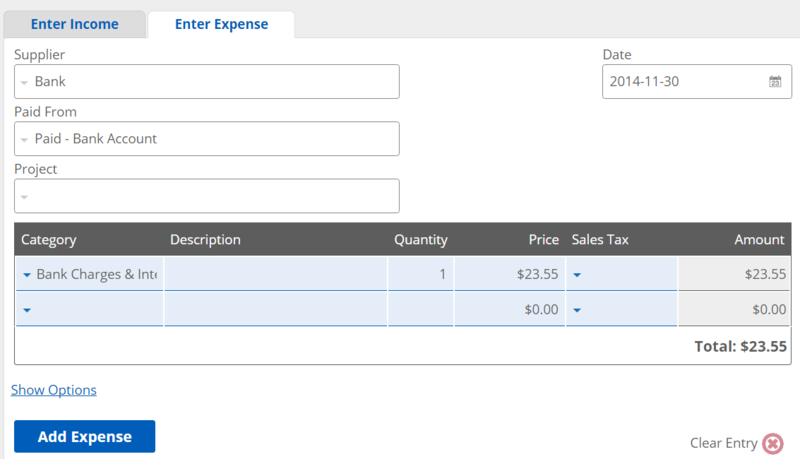 Method 1 - Enter the interest as a second line item when entering expenses. 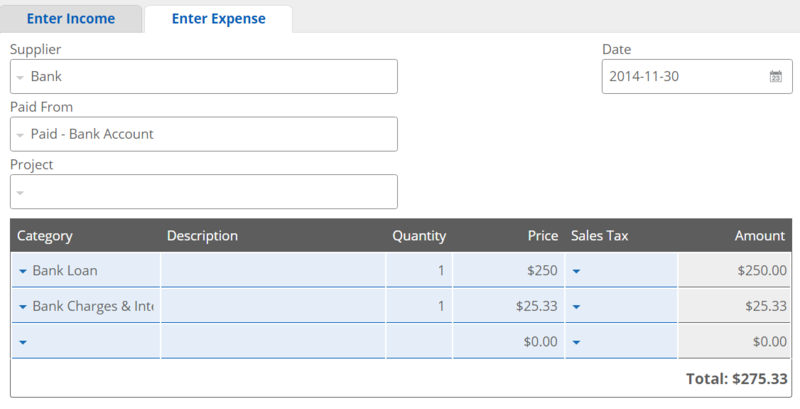 Go to the Income and Expenses page and select Enter Expense. 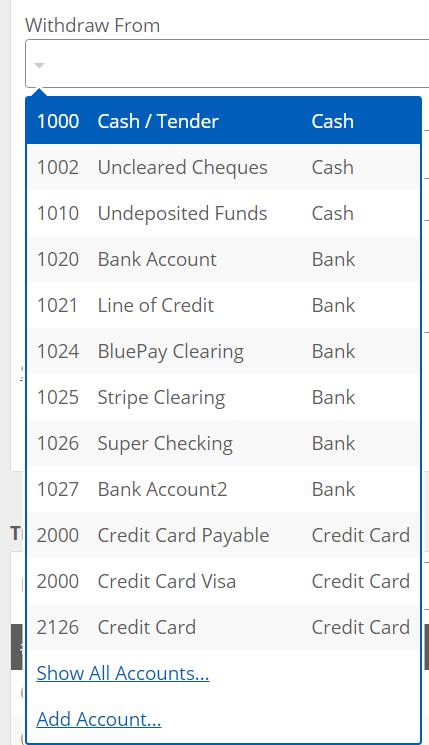 For the Paid From account, choose your Bank Account. and for the Category you will need to have two line items. For the first line item select the Bank Loan account to pay back the principal. 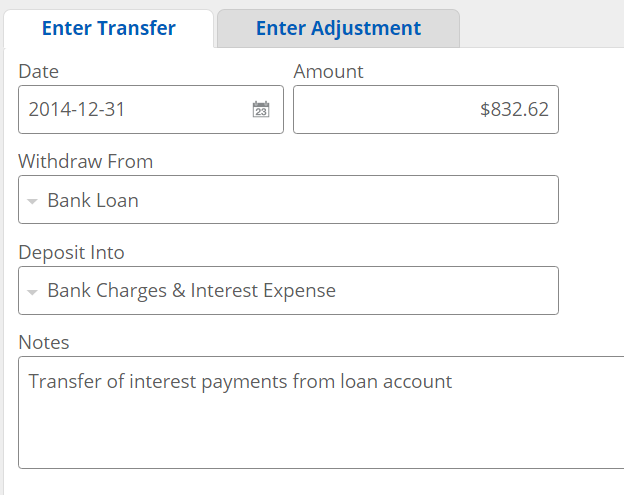 For the second line item select the Bank & Interest Charges Expense account to pay the interest. Credit the Bank Loan account with the entire payment (which would include the principal plus interest). At the end of the year (or quarter) compare the balance to what the bank says you owe and transfer the difference to your interest expense account.